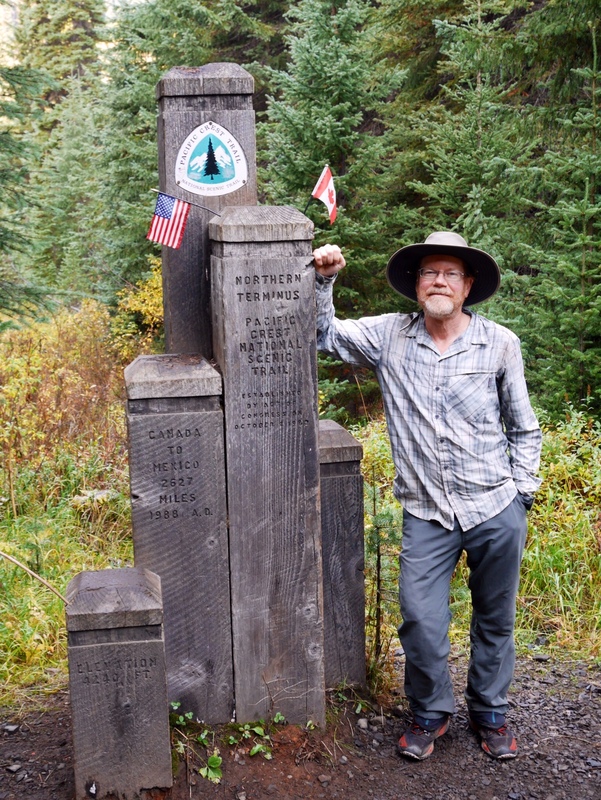 This morning I walked the final six miles to the northern terminus of the Pacific Crest Trail at the Canadian border where I found Deb waiting for me. She had camped at the trail camp about 2/10 mile into Canada. We celebrated briefly (along with a handful of other hikers who arrived at the same time), took a few photos, and drank a tiny bottle of Champagne that Deb carried in. Deb and I then hiked eight miles to the Manning Park where we had a late lunch and checked into the lodge. 2,660 miles of continuous footsteps from the Mexican border to the Canadian border are done. The hike has been an amazing journey that I have thoroughly enjoyed. Tbe Northern Cascades along the Pacific Crest Trail. Today was my last full day of hiking and I ended up camping just six miles south of the Canadian border. I encountered a surprising number of hikers returning to Harts Pass (nearly 20) walking southbound back to Harts Pass after reaching the northern terminus of the Pacific Crest Trail. Hikers sometimes choose not to go into Canada for various reasons, but instead just touch the border and go back south for 30 miles and exit at the first road. Everyone was in a happy mood as most hikers were hiking fairly easy low mileage days through beautiful country with lovely fall colors. Everyone was congratulating each other as they had just completed the PCT or were about to the next day. I arrived at Harts Pass around lunch time, where the staff at the Guard Station was very hiker-friendly. They had ice water for hikers and offered use of the staff trash cans. I ended up camping with a large group of about 10 hikers camped tonight. We spent last night in Mazama at Ravensong’s Roost. Deb drove me back to Rainy Pass after breakfast at the Mazama store. The store makes a good breakfast and was packed with a mix of old timers and rock climbers. The hike was very scenic today mostly traversing the sides of high mountain ridges. Excellent weather. A joy to be hiking even though the end is near. Tortuga’s wife drove me back to Stevens Pass along with hikers Tortuga, Princess, Mr. Sandals, Firecracker, and Tidy Camper and we were off to hike the Glacier Peak section of the Pacific Crest Trail. Another hiker described this as the final exam of the PCT and on many ways this is true. It’s a very beautiful and scenic section of the PCT but in many ways it’s difficult too. I was taking six days so I needed to carry more food than any time since the Sierra. The section involves quite a lot of climbing, about 6,000 feet per day and about 8,000 feet on the third day after Stevens Pass. You definitely need to plan on fewer miles per day in this section. Most hikers resupply in Stehekin, but I opted to go an extra day to Rainy Pass where I met Deb instead. It’s interesting to note that the North Cascades National Park does not honor the PCT thru-hiker permit, the only national park with this policy. The North Cascades National Park was otherwise very nice and the backcountry vacant, except for a handful of PCT hikers.